In my last post, I examined labor market participation in New York State counties. I found that most New Yorkers, both upstate and downstate, live in counties where labor market participation differs only slightly from national levels, but upstate counties with small populations in many cases have labor participation rates that are significantly below the average. In this post, I look more closely at the ways that low participation counties differ from those with higher labor market participation. 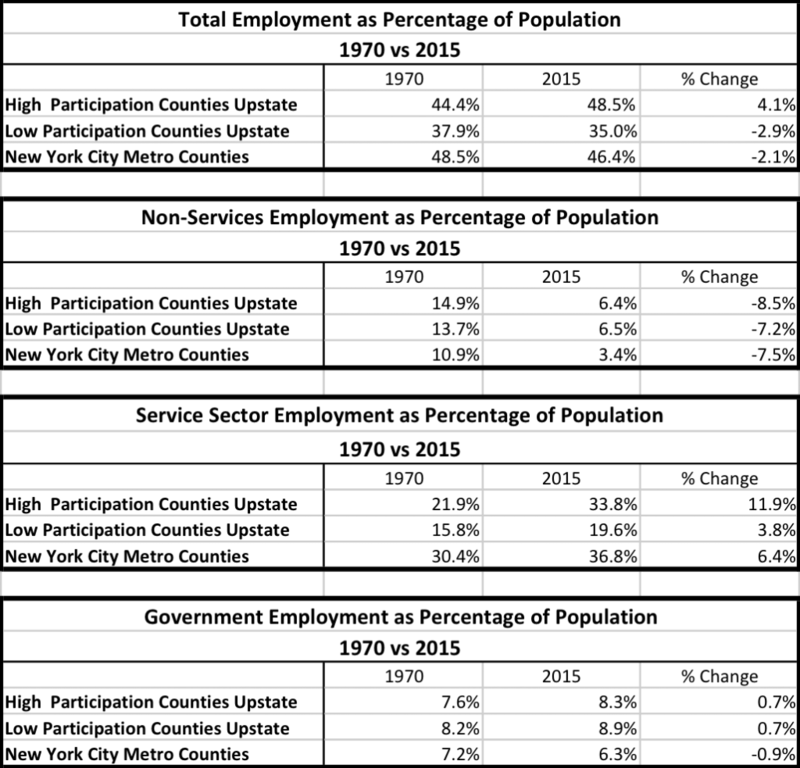 In particular, I examine how income compositions, and industry compositions differ. The data shows that employment has decreased between 1970 and 2015 in upstate counties with low levels of labor participation, largely because weak service sector employment growth was insufficient to offset losses in non-service industries. Earnings per employee were weak in low participation counties as well. In 2015, per employee earnings overall were 16% lower in upstate low labor participation counties than in high participation counties, and 47% lower than those in the New York city metropolitan area. Differentials between per employee earnings were particularly large in relatively high paying service industries, such as information, financial services, and professional and business services. Government transfer payments make up a larger part of personal income in counties with low labor participation because of low employment levels in these counties. Government employment made up a larger part of total employment in low participation counties because of the low level of private sector employment in these counties. 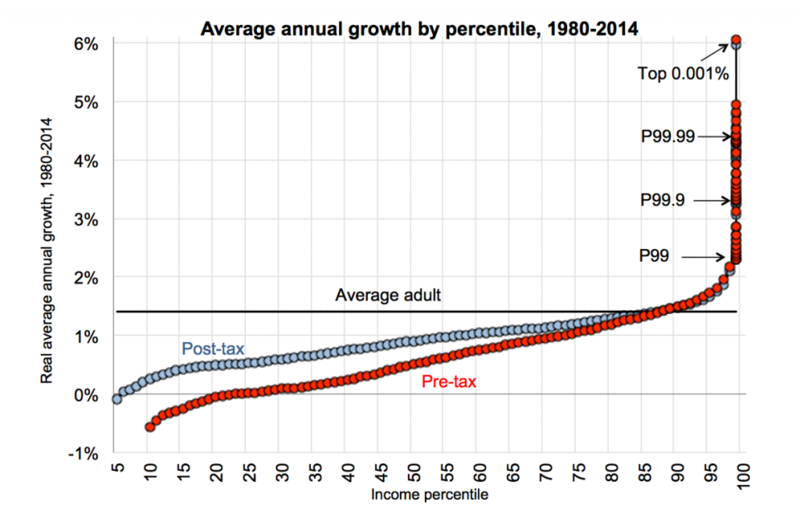 Data from this post is from the U. S. Bureau of Economic Analysis – Local Area Personal Income and Employment tables. Much of the BEA data referenced was taken from the data presentations found at the Headwaters Economics Economic Profile System. On average, the fifteen upstate counties with the lowest levels of labor participation had populations that were much smaller than those with high levels of participation, or those in the New York State metropolitan area. On average, low participation upstate counties populations were only 22% of high participation counties, and 6% of counties in the New York metro area. 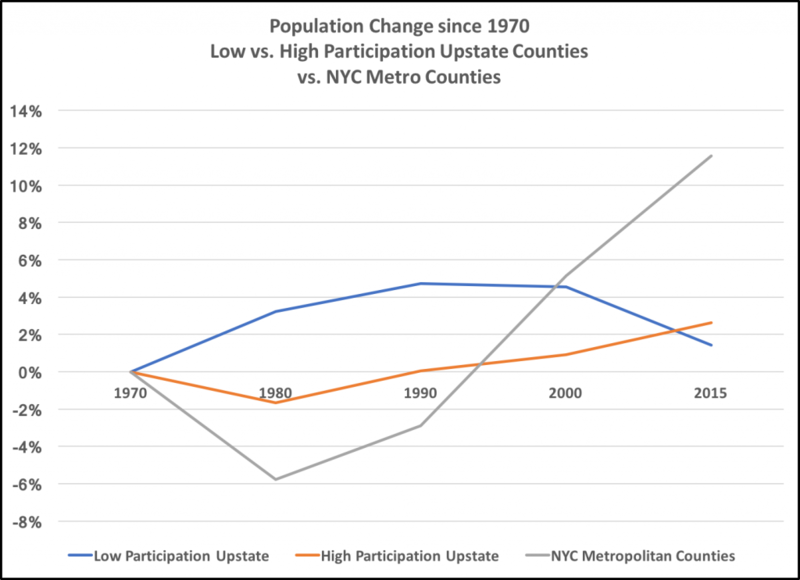 Populations of both the top and bottom 15 participation counties upstate have been essentially stagnant since 1970. While high participation counties showed a small amount of growth between 1990 and 2015, and low participation counties have declined since that year, populations in both have only increased by about 2% since 1970. The populations of New York metropolitan area counties have increased by 12% since 1970, and by 18% since 1980. Not surprisingly, full and part-time employment as the percentage of the population of low labor participation counties was lower than counties where labor participation was higher. Low participation counties had lower levels of employment throughout the period than either high participation counties, or counties in the New York metropolitan area. Significantly, the gap in employment levels between low participation counties and other counties has increased over time – from six to eight percent less in 1970 to 14% to 16% less in 2015. Average wages and salaries have consistently been highest in counties in the New York Metropolitan area, followed by high participation upstate counties, with low participation upstate counties having the lowest average wages and salaries. 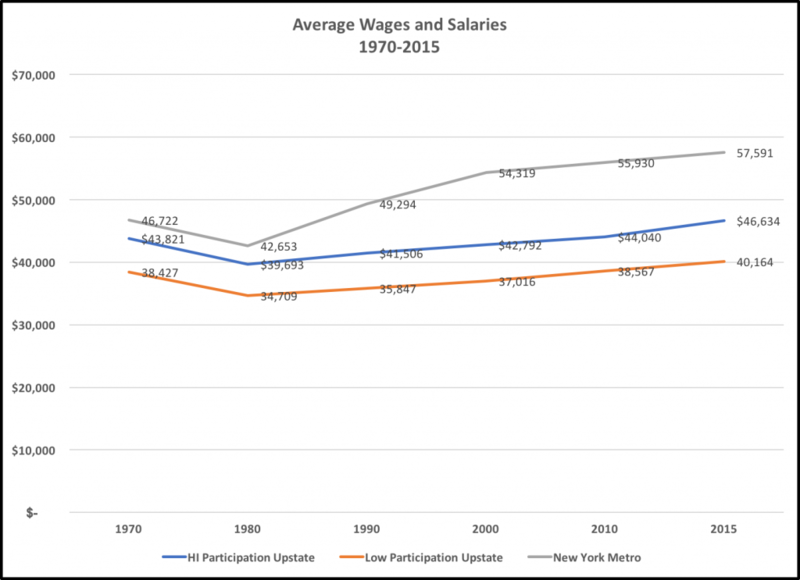 While the difference between low and high participation counties upstate has been relatively constant since 1970 – about 15% – the gap between average wages and salaries in the New York City Metropolitan area and in high participation areas upstate has grown from 7% in 1970 to 24% in 2015. Labor income (work related compensation) is a smaller part of personal income in low labor participation counties than in high participation counties upstate and in the New York City metropolitan area, while transfer payments (such as Social Security benefits, medical benefits, veterans’ benefits, unemployment insurance benefits, liability payments for personal injury and corporate gifts to nonprofit institutions) make up a larger part of personal income in these counties than elsewhere. Transfer payments are 26.6% of total personal income in low participation counties upstate, compared with only 15.9% in the New York metropolitan area and 19.9% in high participation counties upstate. Dividends, interest and rent are 14.6% of total personal income in low participation counties, compared with 21.8% in the New York City metropolitan area. The fact that transfer payments make up more than 26% of per capital personal income in low participation counties compared to 16% in the New York metropolitan area might lead readers to conclude that the amount of government transfer payments per capita is greater in low participation counties upstate than in high participation counties or in the New York City metropolitan area. In fact, that is not the case – per capita transfer payment levels per capita differ little. Instead, they are more important in low participation counties because wage, salary and benefit levels are lower than elsewhere. Employment patterns in high and low labor participation counties upstate and in the New York City metropolitan areas differ. Low labor participation counties had much larger percentages of total employment in non-service sector industries and in government. Employment in service industries was 79% of the total in the New York City metropolitan area in 2015, while in low labor participation counties upstate, service sector employment was only 56% of the total. Service sector employment in high labor participation counties upstate was 70% of total employment. 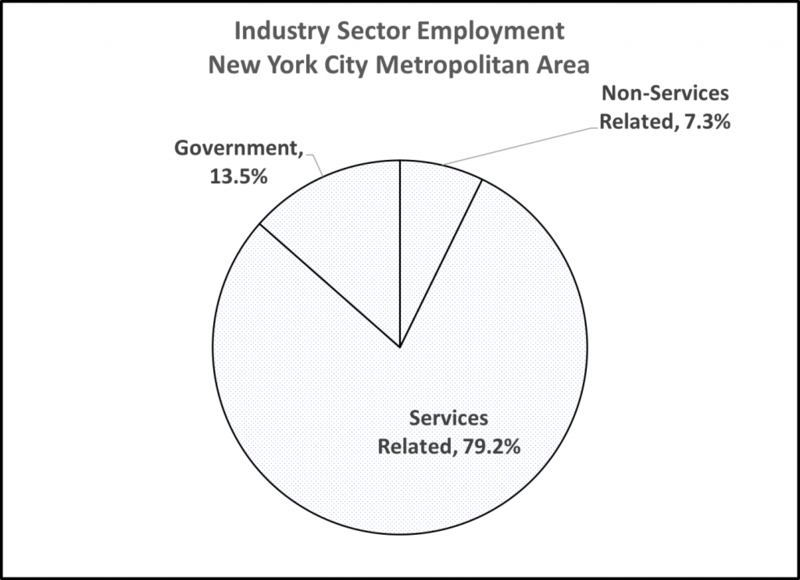 Several relatively high paying service industries – information services, financial activities, professional and business services and education and health services were concentrated in counties in the New York City metropolitan area, with 48% of total employment in the region in 2015. In high participation counties upstate, these industries were also relatively important, having 38% of total employment. In low participation counties upstate, however, these industries only accounted for 24% of total employment. In contrast, relatively low paying service industries, like trade, transportation and utilities and leisure and hospitality accounted for between 27% and 28% of all employment in each region. Non-Services related employment (primarily manufacturing and construction) was 19% of the total in low labor participation counties upstate, while it was only 7% of the total in the New York City metropolitan area. Again, high participation counties upstate were between low participation counties and the New York City metropolitan area on this measure, with 13.2% of total employment in non-service related industries. Manufacturing was 8.7% of total employment in high labor participation upstate counties, 13.3% in low participation upstate counties, and 2.9% in counties in the New York City metropolitan area in 2015. In low participation counties in upstate New York, more than one-quarter (25.4%) of all employment is in government, while in the New York metropolitan area, government employment is only 13.5% of the total. In high participation counties, upstate, government employment was 17% of total employment. Local government employment is a larger part of total employment in low participation counties upstate than elsewhere – 16% of the total. State government employment is also a larger part of total employment in low participation areas than elsewhere – 8%. Why is government employment a much larger percentage of total employment in low labor participation counties? The table above shows that government employment is about the same percentage of the total population in high and low participation counties upstate – between 8% and 9%, while in New York City, government employment is about 6% of the population. But, the percentage of the population that is employed in the private sector is much lower – 26% in low participation counties upstate, compared with 40% in upstate high participation counties and in counties in the New York metropolitan area. Overall, total employment in low labor participation counties is only slightly more than one-third of the total population – 35%, compared with nearly half – between 46.4% and 48.5% in counties in the New York City metropolitan area and in high participation counties upstate. Low labor participation counties upstate differed from high labor participation counties upstate and those in the New York City metropolitan area in the fact that these counties lost employment between 1970 and 2015. Employment decreased in these counties by 6.3% during the period. Employment in the New York metropolitan area increased by 6.7%, while in upstate high participation counties, it increased by 12.2%. While non-services employment declined slightly less in low labor participation counties in upstate New York than other counties studied — 52% vs. 56% and 66%, service sector employment grew much more slowly than elsewhere – 26% vs. 35% and 58%. Employment in low labor participation counties upstate decreased as a percentage of the counties’ populations by 2.9 percent between 1970 and 2015. In the New York metropolitan area, employment as a percentage of counties’ populations decreased by 2.1%. Only in upstate counties with high levels of labor participation did employment as a percentage of population increase – by 4.1%. In low participation counties, non-services employment as a percent of county populations in industries like manufacturing has decreased slightly less than elsewhere – by 7.2% compared with 7.5% and 8.5% between 1970 and 2015, but service sector employment as a percentage of population in upstate counties with low labor participation grew slower than elsewhere in those years. In low participation upstate counties, service sector employment as a percentage of population grew by 3.8% compared to 11.9% percent in high labor participation counties, and 6.4% in counties in the New York City metropolitan area. 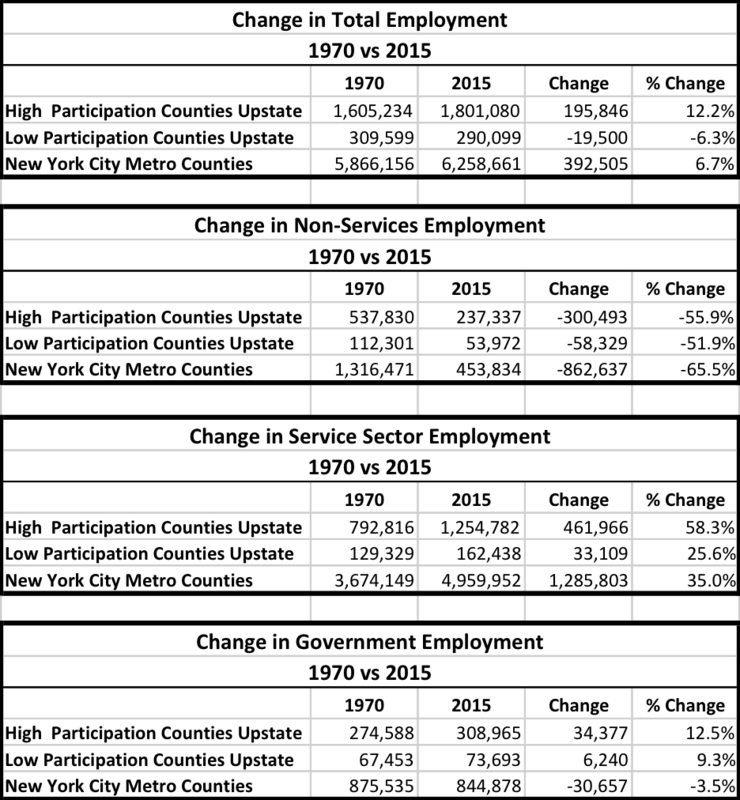 Per employee earnings are the sum of wages and salaries, supplements to wages and salaries, and proprietors’ income divided by employment. Per employee earnings overall, in the private sector, and in government were lower in low participation counties upstate than they were in counties in the New York City metropolitan area and in high participation counties upstate. Overall, earnings per employee were 16% lower in low participation counties upstate than in high participation counties upstate. Compared to counties in the New York City metropolitan area, earnings per employee were 47% lower in low participation counties upstate. Per employee earnings in the service sector in low participation counties show the greatest weakness compared to high participation counties upstate (25% lower) and counties in the New York city metropolitan area (58% lower). Per employee earnings in non-service sector industries, such as manufacturing, in low participation counties upstate were 16% lower than in high participation counties upstate, and 26% lower than in counties in the metropolitan area. Differences in government earnings per employee between low and high participation counties upstate and counties in the New York City metropolitan area. Per employee earnings in low income counties upstate were 14% lower than in high income counties upstate, and 25% lower than in counties in the New York City metropolitan area. A closer look at per employee earnings by industry sector in 2015 shows that low labor participation rate counties upstate were at a greater disadvantage to others in some industries than others. For information services, per employee earnings were 31,536 in low participation counties, compared with 69,604 in high participation counties upstate, and $131,767 in counties in the New York City metropolitan area. For professional and business services, per capita employee earnings were $39,004 in low labor participation counties upstate, compared with $60,015 in high labor participation counties, and $99,132. For financial activities, per capita earnings for low participation counties were $48,746, compared with $66,689 in high labor participation counties upstate, and $200,727 in the New York City metropolitan area. The industries with the greatest differentials between low participation areas and other locations were industries with relatively high per employee earnings. Industries with lower per employee earnings, like leisure and hospitality and education and health services had smaller differences in earnings per employee between upstate low and high participation counties and counties in the New York metropolitan area. But, in my earlier post, based on low levels of participation by low skilled workers, I argued that, “The low levels of participation of these groups in low participation counties probably reflect reinforcing factors, like lower average levels of education among minority group members, the decline of manufacturing industries that employed low skilled men, and low levels of demand for workers without college educations in places where there are relatively few jobs available.” Instead, this data shows that labor market growth in low labor participation counties has been particularly weak in those industries in the service sector, like information, financial services and professional and technical services that have relatively high earnings per employee. In my earlier post, I concluded that, “The ability of low participation counties in small metropolitan areas and rural locations to create the resources needed to diversify their economies to include occupations that match the qualifications of residents are likely to be limited, because of the significant advantages offered by locations that have larger labor pools.” The data presented in this post does nothing to contradict that conclusion. And, because these labor markets are typically small and lack concentrations of workers with skills that are in high demand in growing industries, reversing their decay would present substantial challenges to remedial policy efforts. Government actions can give residents the opportunity to increase their social mobility, though, even if the way mobility can be achieved is to move to locations with greater opportunities. In “Where is the Land of Opportunity? The Geography of Intergenerational Mobility in the United States,” by Raj Chetty, Nathaniel Hedren, Patrick Kline, and Emmanuel Saenz, the authors found that higher mobility is associated with higher quality primary and secondary education, greater family stability, and less income inequality. But, more economic mobility also is related to geographic mobility from low income locations – those places that had higher levels of economic mobility also had higher levels of out-migration. In a recent study by Eleanor Krause and Richard V. Reeves, “Rural Dreams, Upward Mobility in America’s Countryside” the authors conclude that several actions could be taken to increase mobility. These include “increase the number of Advanced Placement courses and improve career and college counseling.” and providing better funding for rural schools. Another option might be to encourage charter schools to open in low labor participation areas. Extending the availability of high speed fiber networks could benefit schools that lack access to online curricula, internet-based research and online testing.